Happy New Year! A fresh start means taking a hard look at some of the bad habits I developed over the past few months. I am embarrassed to admit that my previously healthy eating habit has slipped a few notches. My work schedule does not play well with preparing meals from scratch everyday so I resort to eating whatever’s in the fridge and pantry the minute I walk in the door. This usually means cheese, deli meat, bread, and lots of junk food. I am long overdue for a change. For the month of January, I will give week-long meal prep a try. On less busy days, I plan to prepare homemade easy meals that I can enjoy over a few days. The focus is on more vegetable in different varieties, lean protein, and complex carbohydrates. I am not picky on whether the items fit well within the breakfast/lunch/dinner concept. Since I tend to eat multiple meals throughout the day, it is more important that the portions are controlled and I get a variety of macronutrients in each item. 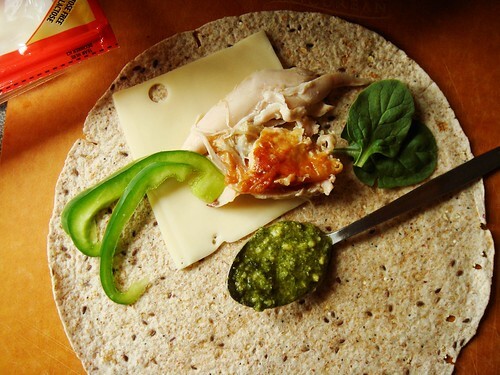 The Rotisserie Chicken Wrap is a favourite that I make frequently. I scaled down my recipe to only 10 sandwiches because it worked better with one chicken and a pack of 10 wraps. With each individual sandwich packed securely in foil, I can easily pack a meal on-the-go by throwing one from fridge to my gym bag. I don’t know what took me so long but I never made frittatas before. I made potato tortillas a couple of times previously and enjoyed the result. But somehow, the copious amount of oil needed in those recipes made me hesitate to make them again. I recently read food52’s master recipe on how to make frittata without a recipe and finally realized my dread of cooking grease should be a non-issue with an excellent non-stick pan. 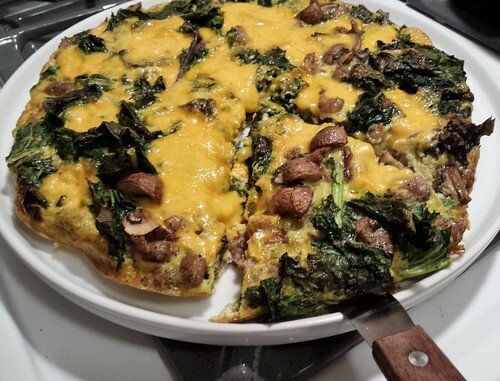 My version of Sausage Kale Frittata used exactly zero drop of extra cooking oil. I sautéed crimini mushrooms and wilted the kale in my trusty non-stick pan. After removing all the cooked vegetable from the pan, I sautéed crumbled mild Italian sausage until the pork was cooked and exuded some grease. I returned the cooked vegetable to the pan and poured 8 whisked eggs that I seasoned with a glob of pesto into the the pan. I scattered diced cheddar cheese on top of the frittata and cooked until most of the liquid stopped sloshing around. I finished the frittata under the broiler to melt the cheese and set the top. To my pleasant surprise, the whole frittata glided out of the pan without incident! Once cooled, I cut the frittata into wedges. I ate them warm. I ate them cold. I ate them plain. I ate them in a sandwich. The convenience and versatility made me wish I didn’t I shy away from frittatas for so long. Of course I still have a sweet tooth and I aim to satisfy that craving in more wholesome ways. I bookmarked the recipe for Fig Almond Breakfast Quick Bread long ago when I came across the post over at The Kitchn. It is exactly the kind of hearty yet healthy treat I am looking for. I soaked chunks of organic dried figs in black tea to plump them up. 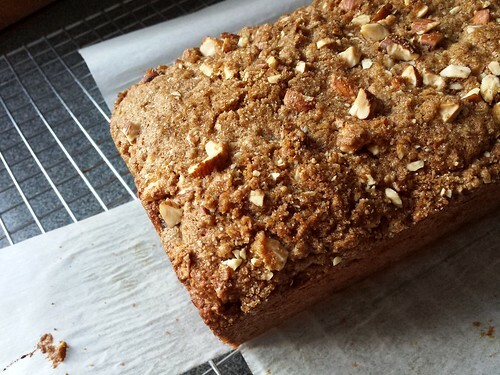 The loaf contained almond meal, almond pieces, and almond streusel topping for ultimate nutty crunch. For my loaf, I used red fife whole wheat flour and a mix of olive oil and melted butter. All of them added up to an earnest breakfast treat made special with the hint of cinnamon and allspice. I can’t wait to wake up to this breakfast tomorrow morning! With my new challenge of preparing made-ahead healthy meals, 2016 is shaping up to be an exciting time in the kitchen. I wholeheartedly welcome this delicious challenge!